And while I think success of all kinds is fantastic, I also think it’s grossly overrated. Buy new clothing, travel more, spend more time with family. Do, see, have…. you fill in the blank. For me it was always, “whenever my business makes more money (success) then I’ll travel more”. 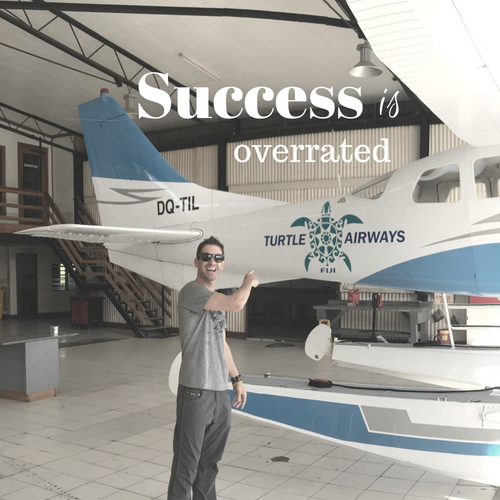 I discovered I don’t need to wait until I’m “successful” and making more money to travel. I can travel now by planning for it, budgeting, saving up, and making it happen. It’s this exact approach that helped me fly to Fiji on Turtle Airways, a dream of mine that I thought was only possible when I made my millions and became “successful”. This is why I say success is overrated. We don’t need to wait until we’re successful to do the things we love and want to do. More often than not, we can do those things sooner than later. Whatever success we seek, if we look close enough, we can have and experience those successes now.